Since Annelise has been in basketball camp this week Scott and I have been able to go on two lunch dates (YAY) which has been fun. Not to sound disgruntled or ungrateful but early in the week I asked him to take me to a local Indian restaurant because 1.) they have a lunch buffet so it'd be a great way to try different dishes since we've never eaten Indian food and b.) Annelise wouldn't feel cheated out of eating Indian food while she was at camp (or so I thought). For several reasons (okay, mainly because Scott was worried spicy food would mess him up prior to yesterday's job fair thingie) we decided on Thursday. And then we had to change our plans. Because for today only chili dogs are only 88 cents at James Coney Island and his coworkers have been talking about going all week. I've been jilted by a chili dog. 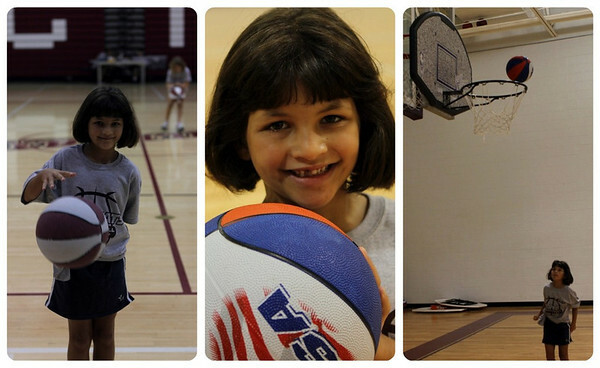 Since today is the last day of basketball camp I wanted to take some pictures of Annelise getting her hoops on this morning. She was soooo excited to have me stay for a bit and also reminded to come early for the award ceremony this afternoon. At least she seemed excited as we were driving and then walking up to the gym. Whole other story once we opened the gym door, you know, where all the kids and all the balls and all the hoops were. But I still managed to get a few shots before I slinked on out so as not to embarrass her further. It's a good thing wives and moms have thick skin. Now I'm hungry...Indian food is the best! But when I looked it up calorie-wise, it's horrendous! Eek! But coneys are pretty tasty too!